For the academic year 2018-19, the University of Hawaii at Manoa has a number of international scholarships to study undergraduate programme. 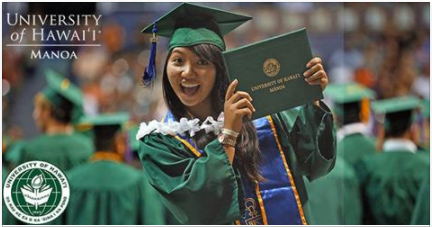 International Student Services (ISS), as a resource to international students and the University of Hawaii at Manoa campus community, encourages and supports international students to meet their educational, professional and personal goals. The University of Hawaii at Manoa is a public co-educational research university as well as the flagship campus of the University of Hawaii system. Founded in 1907, the University of Hawaii at Mānoa is the flagship campus of the University of Hawaii System. A destination of choice, students and faculty come from across the nation and the world to take advantage of UH Mānoa’s unique research opportunities, diverse community, nationally-ranked athletics program, and beautiful landscape. Consistently ranked a “best value” among U.S. colleges and universities, our students get a strong education. All applicants, regardless of country of origin or citizenship status, will be required to demonstrate competence in the English language prior to admission. Eligible Countries: The US and international students are eligible to apply. Completed a UHM bachelor’s degree and enters a UHM master’s program will not be eligible for awards in his first year of the master’s program (unless he is applying for an internship). English Language Requirements: All applicants, regardless of country of origin or citizenship status, will be required to demonstrate competence in the English language prior to admission. You can only access the application through your HAWAII.EDU account. Do not attempt to use a regular GMAIL account. Additional directions will be provided on the application regarding the submission of other required documents (e.g., statements, budgets, recommendations).